Right from an early time in the project, I knew I wanted to paint a piece with birds. I have some of them in the studio that I use when I teach classes; we use them for models. 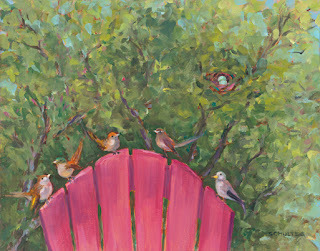 I saw them perched on the back of the pink chair, even taped them up there. I was clear on why: to celebrate Mom’s joy in singing. She was part of singing groups for many years, and would easily burst into song. As we did the dishes each night, we would sing together, all the old ones. I called them “kitchen sink songs”. Or so it was planned. 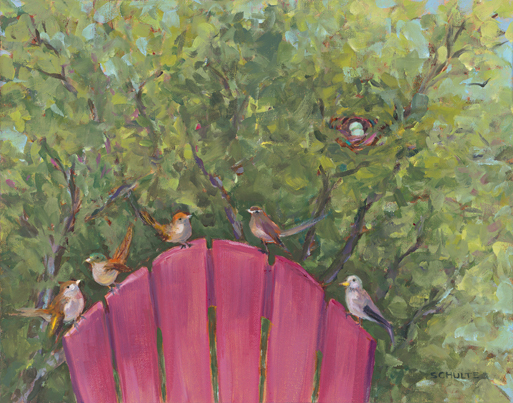 I started the piece and placed the birds on the chair in front of a tree that was in its autumn splendor out my studio window. But I could not get into it somehow; it just wasn’t right. I also had a nest I bought at a flower show and I kept putting it on the chair, it seemed to be telling me to put in. So I did, but I had to turn the tree to springtime dress, because that’s when eggs are seen!. As the green started to take over, I opened my eyes and saw what I had. Why 5 birds? Why THOSE five birds? Why was the nest so important? Ahh, the awakening. Lynne, Ricky, Paul, Georgie, Joey…I can hear her call us to dinner now. This piece is a celebration of my mother’s family, her five children. Mom loved us and was always ready to drop everything to be with us; no matter if the house needed cleaning. Our doors were always open to welcome our friends and her heart expanded to hold many foster children. The nest is still full because the door is always open. I even know who these birds are though I didn’t paint them deliberately; From the left: Me, Georgie, Joe, Paul and Rick. Rick died at age 27; he is flying away in the upper right. Mom’s children were her song, and the songs were joyful, energetic, mournful, loving, and heart lifting. I'm in the Boston Globe!